Good lighting is the single most important element needed to take a good photograph. 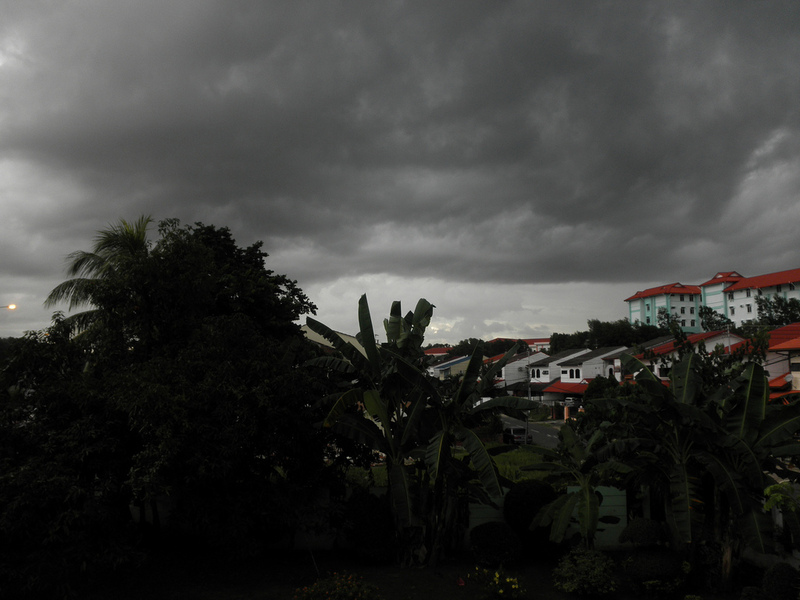 Unfortunately the lighting conditions aren't always good for a photographer. There are some things that can be done by the photographer to work with bad conditions, for example indoors at very close distances they can use a flash, but often the photographer will end up with an image that doesn't have correct lighting. Parts are over and under exposed. We are going to go through these three images and try to fix some of the lighting issues with them. Let's start by opening the overexposed photo in the GIMP. The above image is very bright and rather low contrast. To try to remedy this, let's use the brightness slider to lower the brightness, and then the contrast slider to raise the contrast. 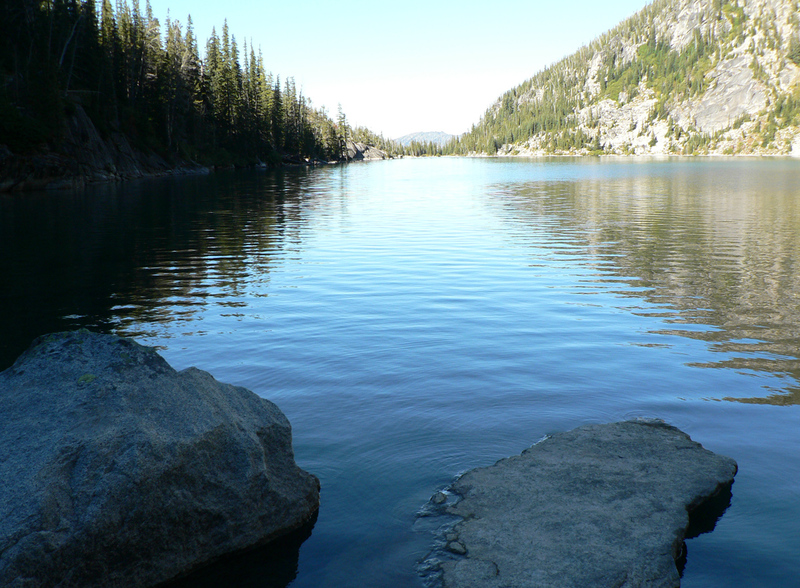 As you can see, modifying the image in this manner will really bring out the color of the image. 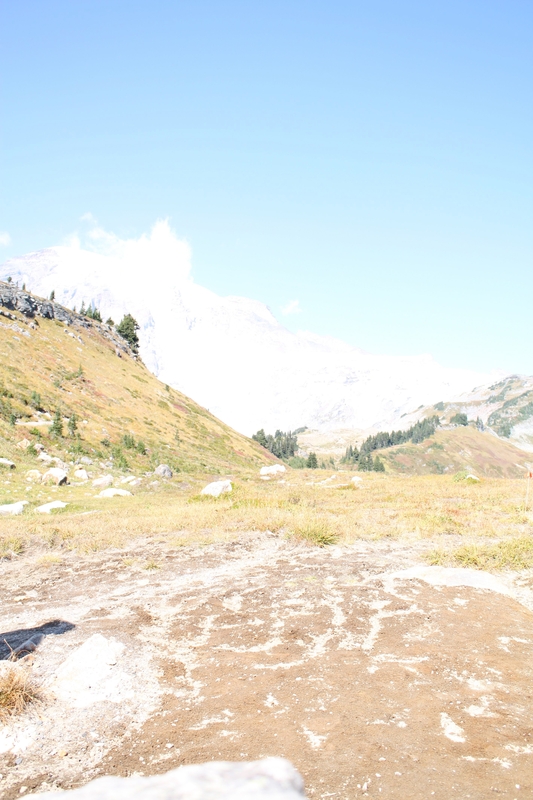 Also, you can see more detail, like the features of the snow-covered mountains in the background. When you like how it looks, hit OK for the changes to be written to the image. For a simple picture such as this, that might be enough, but sometimes you need a little more control over the picture than just the brightness and contrast. First, let's re-set the picture, to get back to the unaltered version we can just undo (Ctrl+Z) enough times to remove all the changes we've made, or we can simply click File -> Revert to get all the way back. Once we're back to the beginning, we will modify the image again, with a higher level of control this time. 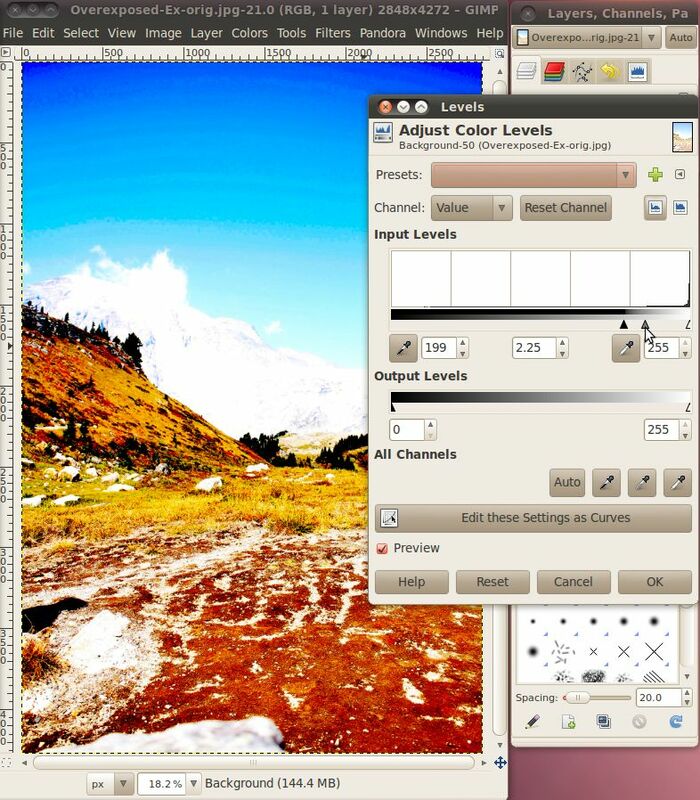 To get to this next level of control, we'll use the Levels dialog, by selecting the Colors -> Levels menu. There are three important parts of this tool that we will focus on. The first is the "Channel" drop down. If you click this you will see the options for "Value", "Red", "Green", "Blue", and "Alpha" which is grayed out. We won't be using the R, G, B, or A channels here, but just be aware that you can do the same thing we are going to learn about in a moment to any of the color channels by themselves. Here, we're going to focus on the value channel. Selecting the value channel causes the tool to combine all three color channels into one and work with it in that manner. This value channel can be thought of as the same image if it was converted to 8-bit black and white. This mode is really called "grayscale" because there can be 256 different levels of gray. Here's the image actually converted to grayscale as an example. Notice how the image is very bright, almost white. Even the dark areas are only very light gray, definitely not black. Looking back at the previous example with the brightness-contrast dialog, we can now get a clearer understanding of what it was doing. The decreasing the brightness changed the all the different shades of the above image to a darker shade of gray and increasing the contrast made the darkest part of the image more dark while leaving the lightest part alone. 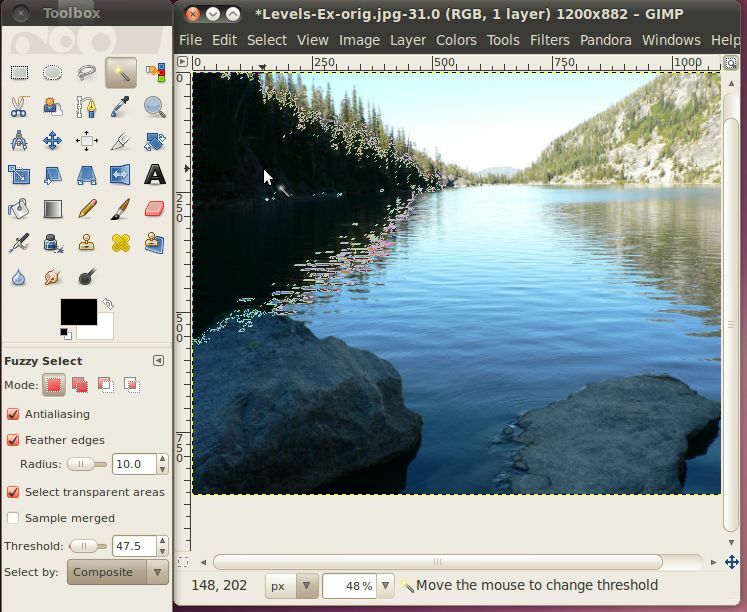 The only difference is that the GIMP didn't need to have a grayscale image to do this, it could mathematically determine the levels that would correspond to the gray image for the different colors, called the values. 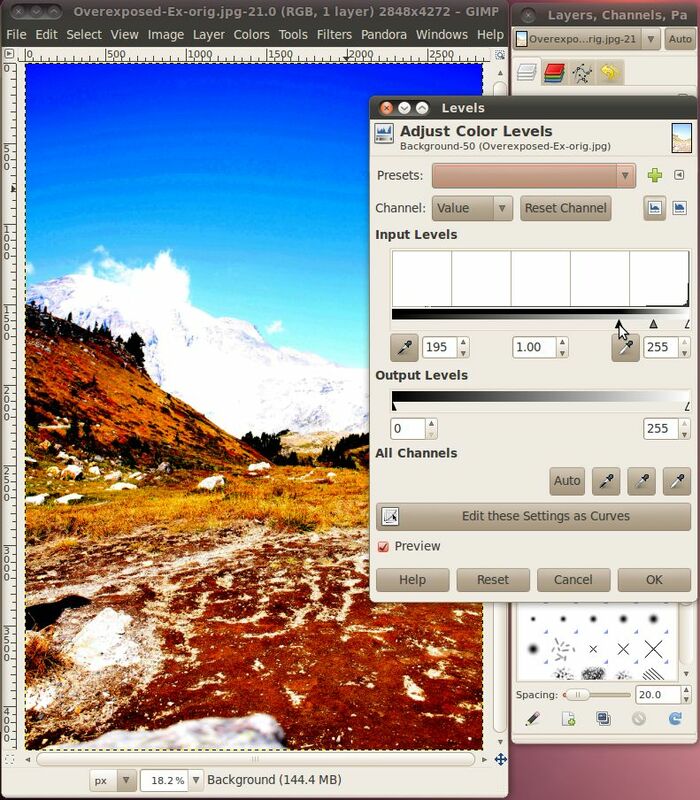 In the box below the channel selection under the title "Input Levels" is a graph that is called a histogram. 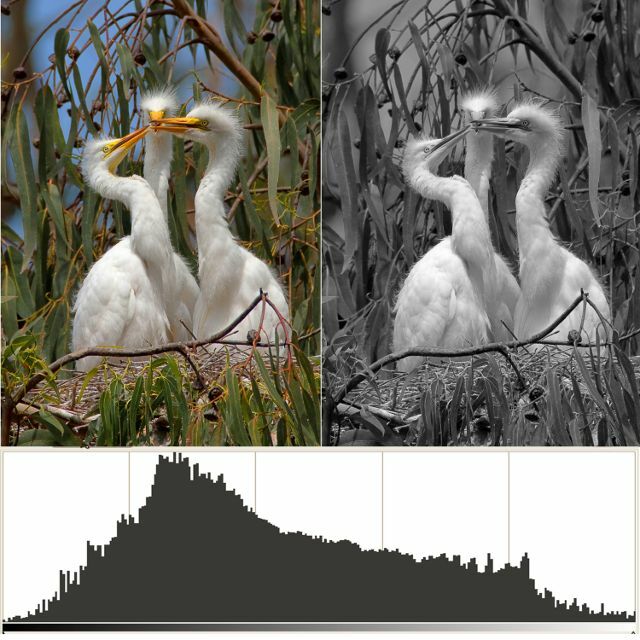 This histogram tells us the number of pixels in the image that correspond with each value. Below the histogram is a gradient from black (left) to white (right), this gradient is actually the scale for that axis of the graph. So, the height of the graph over a particular value along that gradient corresponds with the number of pixels that have that value. Because this image is so overexposed, the graph shows that almost all the pixels are to the very far right (white) part of the graph. Before we move on, let's look at a picture with a more normal histogram. As you can see from the grayscale image on the right, a lot of the image, where there is the grass background, is rather dark, but not quite black. Most of the birds is rather light, but only a tiny section of them is really white. Thus we see a huge part of the graph in the dark section, about a quarter of the way up the graph. We see another peak towards the right where the birds' bodies are, and just a tiny amount trailing off to the completely black and white sections at either end of the graph. Getting back to our overexposed picture from the mountains, we can see that the histogram shows that it is almost all completely to the right (white) side of the graph. In fact, the true white (value of 255) has quite a few pixels. That means that these pixels are completely over exposed (also known as burned), and the areas where there are a lot of these can never be corrected to add more detail. Any information that the camera may have found about them was lost because they are at the maximum value. That is just the limit of the 0-255 scale. 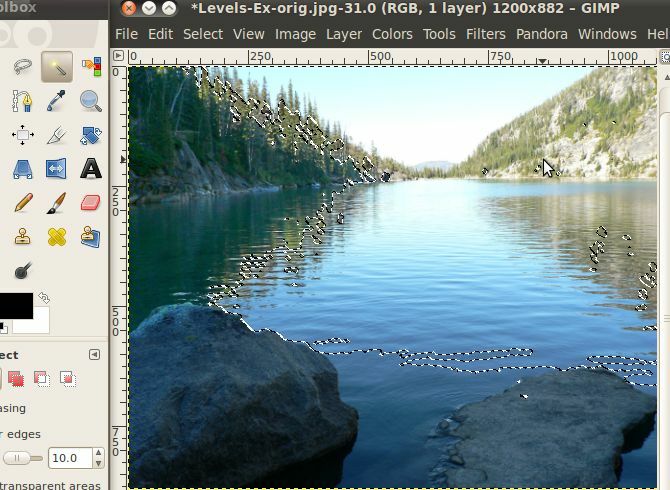 However, we can use our tools to bring out some more detail on all those other pixels. You will notice under the histogram there are three triangles. We can use these triangles to set the darkest color in the image, the brightest color in the image, and the middle color in the image. To help fix this image, we are going to move the darkest color up. This will cause all the pixels represented in the histogram to the left of where we move the arrow to have their value to set to zero or true black. Every other pixel everywhere else in the image will have its value reset so that they take up the entire range from 0 to 255 while keeping their existing relationship to all the other pixels. There, that looks a lot better, we can see all the color of the foreground and make out some features on the mountains in the background. There's one last adjustment we can make here, and that is to change the mid level to tone down some of the bright brown/red colors that have taken on an almost unnatural appearance. Just slide the middle, gray triangle a bit back to the left and check the results. There, that looks pretty good. 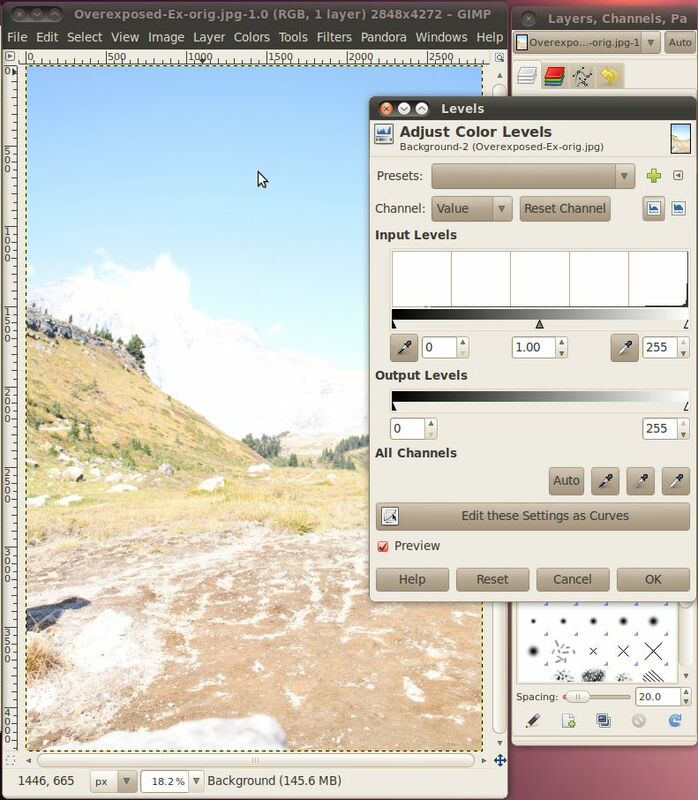 When you're happy with your settings, click OK to write them to the image. 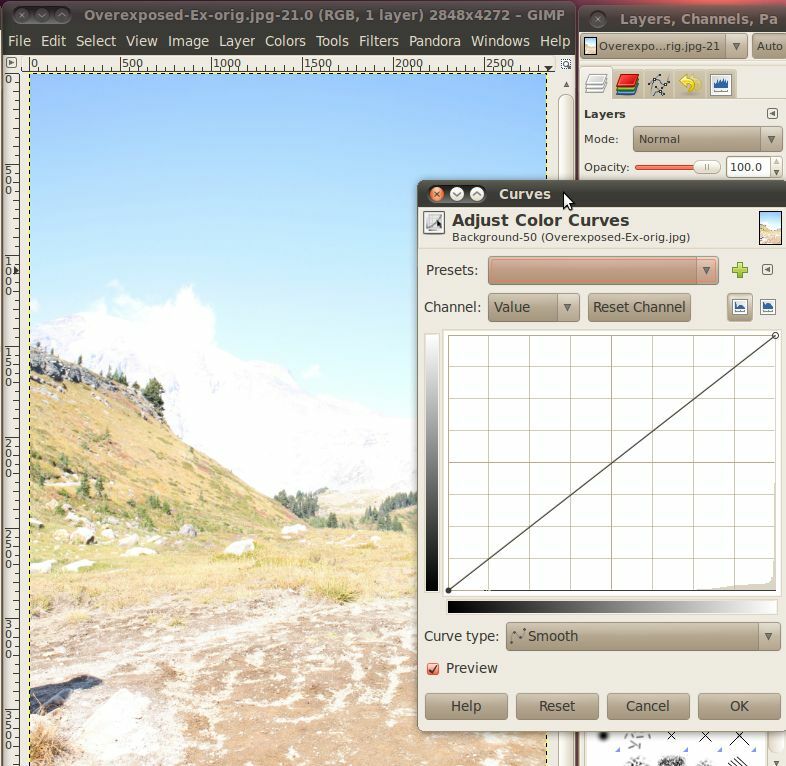 Now there's one more tool that we can use that will give us even more control over those colors in the middle, that is the curves tool. After re-setting the image back to the beginning (either use Ctrl+Z or Revert) click Color -> Curves to bring up the dialogue. You can see in the background that it has a histogram on it. The only difference is now there is also a gradient on the vertical axis, that corresponds to the line running across the graph. This line is the curve that we will be manipulating. The end of the curve that is on the bottom side of the window corresponds to the dark triangle from the levels dialog, and the end of the curve that is on the upper side corresponds to the white triangle from the levels dialogue. The whole curve in the middle is a much more complicated version of the gray triangle from the levels dialogue. We can go ahead and set the low end back up to where we had the dark triangle in the previous example. Once that is done, we can click and drag any point on the line going through the graph to create curves in it. This allows different values in the image to be raised and lowered differently. You can drag multiple parts of the curve to make complex systems of lightening and darkening different original values. Here I have moved the low end value up about two thirds of the way across the graph, then the curve jumps a little bit and then levels off giving a dark (but not completely black) value to the pixels near that end. The curve then increases in the lighter pixel values keeping them steadily increasing in lightness up to white. 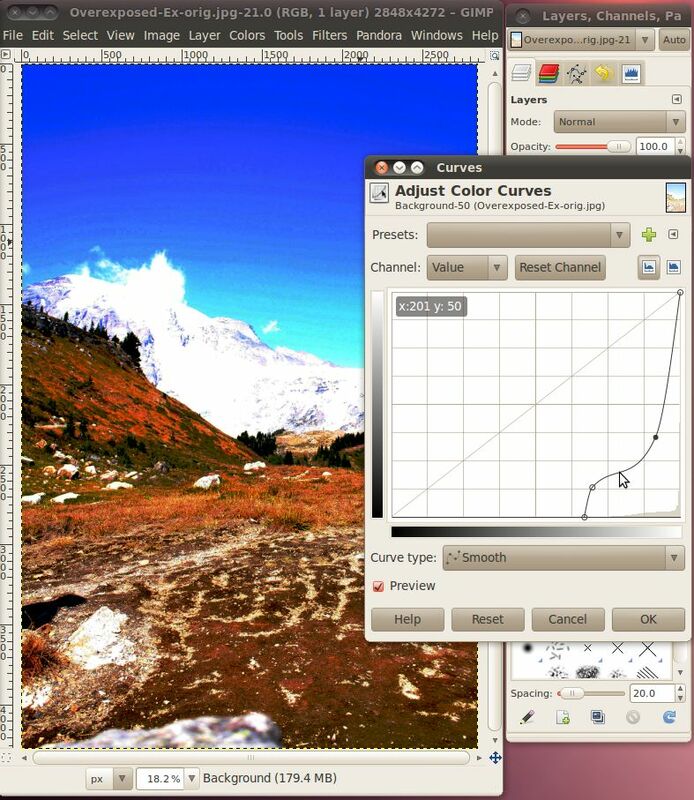 From the curves dialog you can quickly and easily play around with lots of different values for the image until you have exactly what you want. Then just click OK to write the change to the image. Now that we've got all the tools in hand, let's go and try this on the underexposed example. 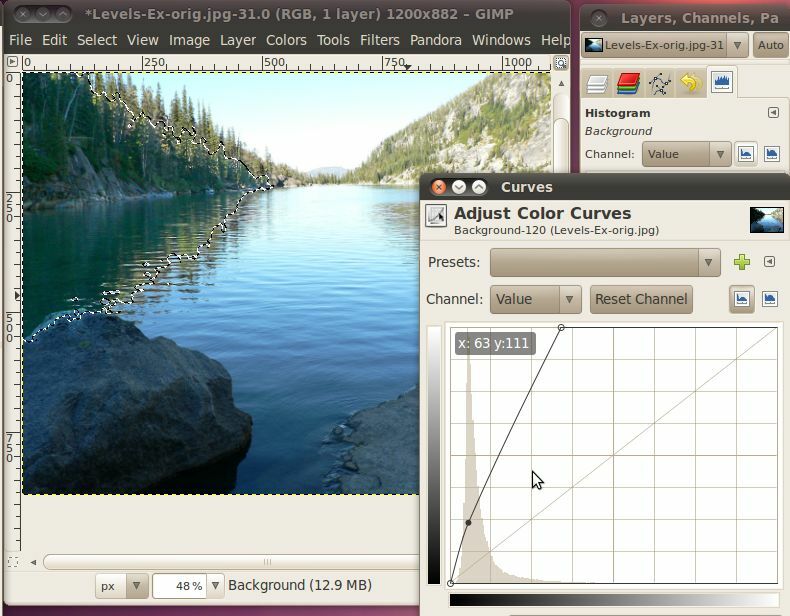 Let's open it up in the GIMP and jump straight to the curves dialog. Here we can see that the histogram is quite a bit broader than it was for the overexposed image. This would have held us back a bit if we were just using the brightness-contrast or levels dialogs, but not in the curves dialog. The first thing we should do is lower the highest value down a bit, to about where the histogram starts trailing off. Just click on the circle along the top and drag it left keeping it on the top until it is over the end of the histogram. The next step is to bring out some of the color in the dark shadows. 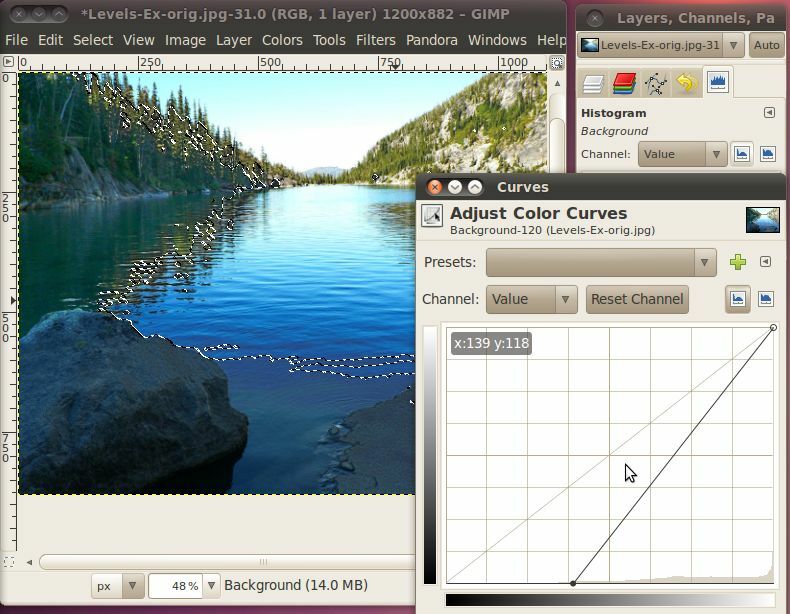 We can do this by increasing the brightness of the curve while it is in the further left areas of the graph. Continue to experiment with this until you find something that looks good to you, then hit the OK button. Finally, let's open up the image that has parts both over and under exposed. 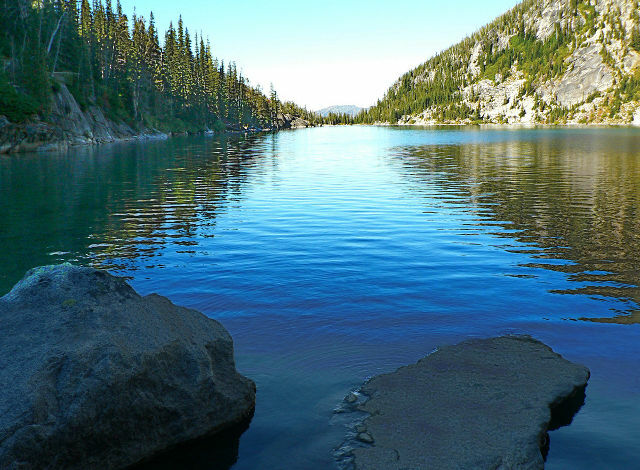 When we've got it open, we can see that there is a section on the left, in the trees that is almost completely dark, while at the same time the mountains on the right are too bright and washed out. 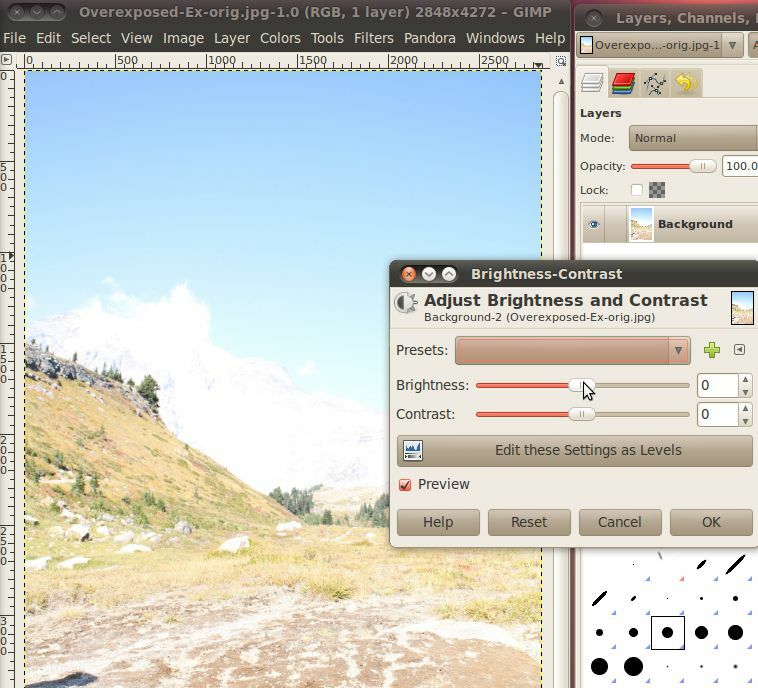 If we go and open the curves dialog we can try to lower the brightness on the bright parts, and raise it on the dark parts, that makes it a little better, but still doesn't make the image look that great. Instead, what we need to do is lower the highest possible brightness for the dark parts, and raise the lowest possible dark for the bright parts. But how can we do that all in the same image? 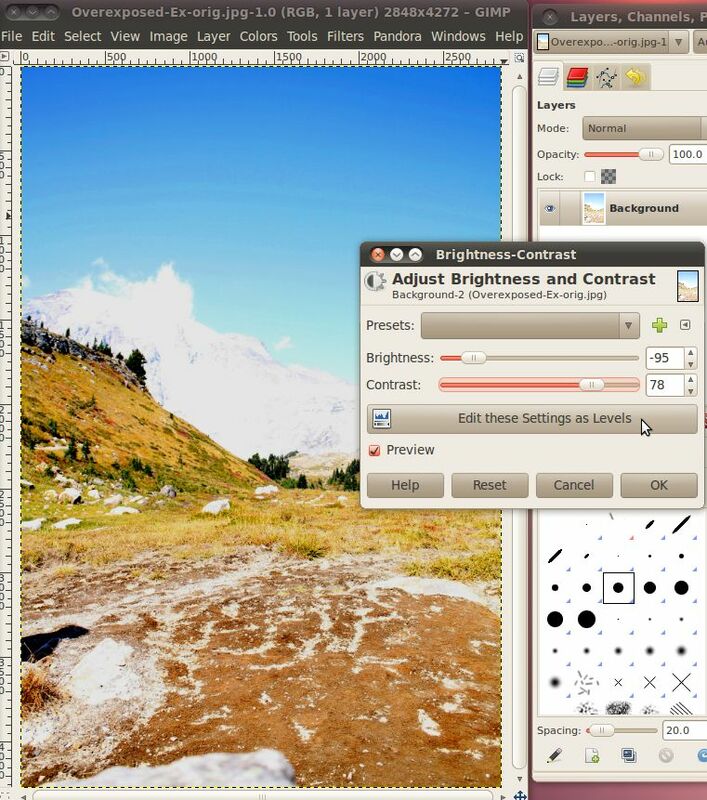 The trick is that you can use the curves (and levels and brightness-contrast) tool on selections of an image instead of the whole image. So all we have to do is select the dark part, perform a correction there, then select the bright parts and perform a different correction there. To do these selections we'll give the fuzzy select tool a try. Once we have it selected, we click on a pixel in the area we want to select, then while holding the mouse button down, move the mouse down and left to grow the area. The Fuzzy Select tool will automatically grow the area in a way where it selects other nearby pixels that have a similar color or value. One tweak that we can make to this tool is to enable the "Feather Edges" option in the fuzzy select tool options. This will cause the area that it selects to blur the line between what is and isn't selected. Doing this will cause the level adjustments that we are going to make to decrease around the edges so that you don't get sharp differences between sections. So, let's go ahead and pick a pixel in the dark area behind the trees. While holding the mouse button down, move the mouse down and to the left, you will see the selected area grow. Keep it going until you have the dark area in the trees selected, then let go of the mouse button. Now that we have our selection made, we can go ahead and bring up the curves dialog and work our magic. Here I moved the maximum white value down to right where the histogram trailed off. I also lowered the dark a little bit at the bottom. Click OK, when you're set. The next step is to select the bright areas. Again we will use the fuzzy select tool to select the appropriate area. 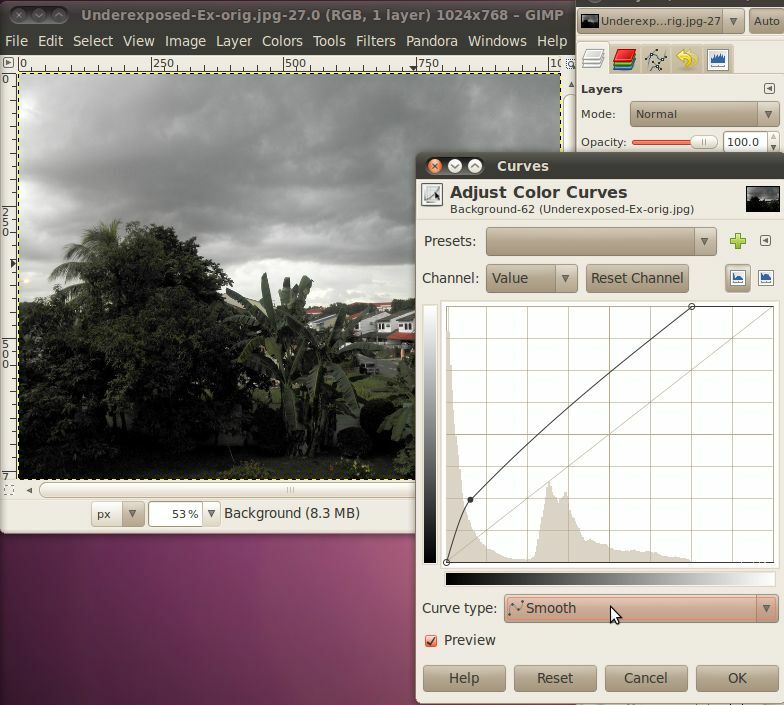 Once we have the selection, we'll open up the curves dialog again, and make our correction on this area. This time I simply moved the lowest dark point up to the bottom of this histogram. When you're happy with your settings click OK.
Nice and crisp, with lots of details throughout the image.